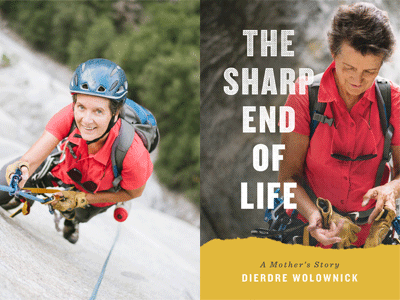 Motivational speaker, musician, marathoner, and rock climber, Dierdre Wolownick discusses her motivational memoir, The Sharp End of Life: A Mother's Story. At 66, Dierdre Wolownick became the oldest woman to climb El Capitan in Yosemite--and in The Sharp End of Life: A Mother's Story, she shares her intimate journey, revealing how her climbing achievement reflects a broader story of courage and persistence. Dierdre grew up under the watchful eyes of a domineering mother and realized early on that her parents' plans for her future weren't what she wanted for herself. Later, what seemed like a storybook romance brought escape, with new experiences and eye-opening travel, but she quickly discovered that her husband was not the happy-go-lucky man he had first appeared. Adapting as best she could, Dierdre juggled work and raising two young children, encouraging them to be fearlessly confident. She noted with delight how her "little lady" Stasia took it upon herself to look out for her baby brother, and watched in amazement as Alex started climbing practically before he could crawl. After years of struggle in her marriage and her ultimate divorce, Dierdre found inspiration in her now-adult children's passions, as well as new depths within herself. At Stasia's urging, she took up running at age 54 and soon completed several marathons. Then at age 58, Alex led her on her first rock climbs. A world of friendship and support suddenly opened up to her within the climbing "tribe," culminating in her record-setting ascent of El Cap with her son. From confused young wife and busy but lonely mother to confident middle-aged athlete, Dierdre brings the reader along as she finds new strength, happiness, and community in the outdoors--and a life of learning, acceptance, and spirit.